I love how simple yet clever your designs are! This vest is wonderful. Wonderful inspiration. Simple and clever, many thanks! i am planning to build the coze vest soon. as i was perusing the various sites i came across one that showed the finished item but also showed a miriade of photos of other completed projects with many interesting variatons. of course, in my mad pursuit i failed to bookmark the page. duh. i am so hopeful that you can steer me in the right direction to reconnect with this page. i need it SO bad! Great idea! Wonder how it would look with long sleeves added………..
Just the kind of pattern I like; simple but intriguing and infinitely customizable. Love your ‘just can’t be bothered’ instructions. Could you please define “English Moss Stitch”? (K1, p1) across, then on the WS, k every k st and p every p st. This is so cute! Which yarn to use from my stash is the biggest problem. Çok güzel bebek yeleği yapmayı düşünüyorum. Olur değil mi? I follow your blog in Portugal, with great interest and enthusiasm. I really like your models and ideas. Following your model I made the coze using the pattern for the counterpane “Theresa’s Pattern” and for the border the “Florence Border” from the book “Knitting Counterpanes”, Mary Walker Phillips. If you want visit my blog (http://meadadobada.blogspot.pt/2013/02/laylock-coze.html), there are photographs of my/your coze. Thank you for generously sharing. I was thinking about how I might embellish a coze a little. And then I saw yours, embellished a lot! It looks beautiful. Very inspirational. This variation is very fancy and lovely; just as “literary” as the other! Your site is veeeery (!) lovely. I cant seem to get the pattern for this. How do you download the pattern???? I haven’t even been able to find the directions for it. You are a genius. Thank you for great patterns and ideas! Would you please have the directions for the Coze Easy Knit Vest Pattern as I have a friend that is looking for a pattern that she can knit for her winter project. Good morning from a cold South Afrcan highveld winter. I have now knitted this Coze pattern in multiple sizes, from 4 year old to a size 42. It is such a wonderfully easy pattern. I dont knit in two separate pieces. I pick up stiches and knit the front as part of the back. It looks amazing. The directional change makes the pattern so interresting. 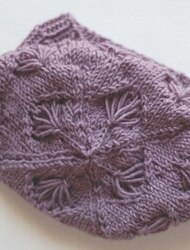 I have also used mitred squares, a lace pattern and different thicknesses of yarn. 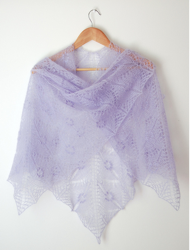 This is the mist versatile, beautiful pattern. This is one for my file! Thank you so much for sharing! Lol this is THE best explanation of a pattern i have ever come across. Definitely going to make this. Thank you so very much. God bless you. I have tried to down load this lovely looking cozy vest. I have read you blog, hoping the pattern would be there. Please can you e-mail me the pattern, I would love to knit it for my granddaughter. 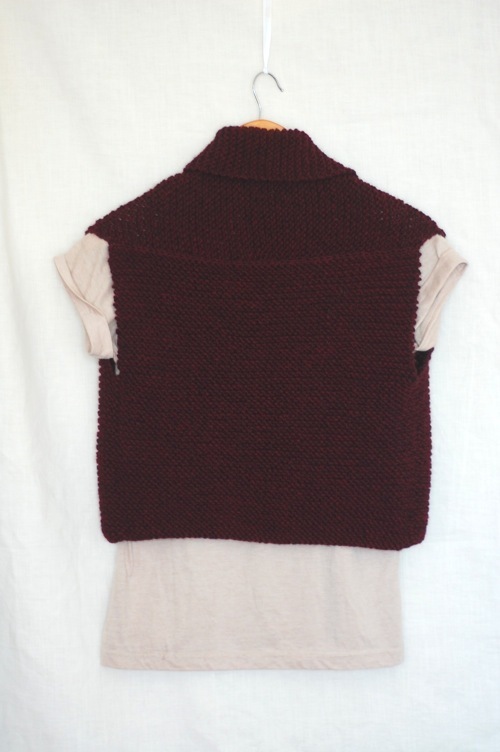 I would love to make this vest, but I need a real pattern:no.of stitches for size medium, no. 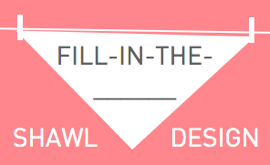 of rows, how to put it together, etc. I cannot figure it all out myself. Please e-mail me the pattern specifics: #of stitches, needle size, etc. I am teaching a woman with neurological impairments to knit. We just finished a simple garter stitch dish cloth and were looking for something a bit more challenging for her next project. THIS IS IT!!!! A little more interesting and something she can wear. Thank you. You cannot imagine what this will mean to her. I see people are requesting a pattern. Is there one? I too would like it. I am definitely going to try this but a longer version. It is just perfect for slipping on in these cold days. As a diehard Georgette Heyer fan, I also enjoy a comfortable coze! Someone found some handspun BFL in the “pass it on” shed at the local transfer station (dump) and gave it to me. It’s labeled BFL, is dark brown and one skein was plied with a strand of hot pink silk. I’ve sat with it wondering that to make. Then I saw this pattern – ideal! The one skein plied with silk will be used for the portion near my face and the front and the remainder will be the vest. If I don’t have enough (and probably won’t) I can combine it with some dark red woolen worsted (mitered square either stripes or as much brown as I have then red). Thanks for such a wonderful idea! 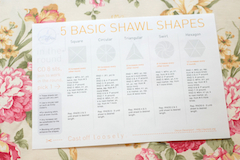 I’ve used your shawl worksheet to great success – don’t know how I missed this. 3. I was thinking of doing it, as you suggest, by picking up stitches & knitting the front right onto the back, so as to avoid sewing. But to do that, you have to figure out just how much ease to leave for the arm-holes — & since the “front” part pushes the back part down in back… I was playing with a measuring tape to make a sample up, so I could find any possible pitfalls… Since the A & C measurements are the same on both pieces, half the arm-hole is theoretically in front, & half in back. But the back piece is below the normal shoulder seam line. I too would like to knit this vest but I need # stitches, etc. for a size large. Please tell me where to do. I am anxious to start this vest. Have been looking for a simple vest with no complicated instructions. You did it. I just need to know what size needles to use. I have a size 5 mm #8 with a standard weight yard. Will that work? Love your site & patterns! I too, am a beginner. I was wondering how many stitches to cast on for each piece. I am not sure about the pattern. Is there a way to actually have one??? Thank you, it looks lovely and I would like to try making it. it makes you look skinnier. 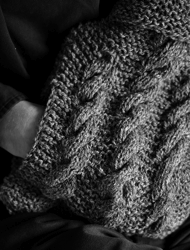 I founf this pattern and have started knitting it. 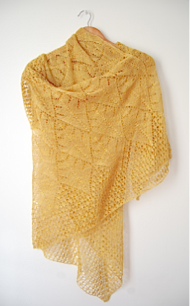 I have a knitting blog and I blogged about finding this pattern and put a link to it on your site in my post. Hope you don’t mind. If you do please let me know and I will remove it. 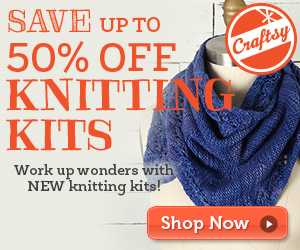 I am a beginner at knitting and wonder if I could substitute the DK yarn for Chunky with needles 5.5mm? This is BRILLIANT! 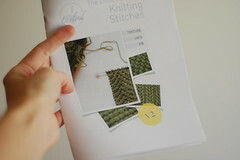 I can’t wait to make it, and pretty much guarantee it will be made with BIG NEEDLES. I’m so impatient. That being said, it will probably take just a couple of hours at most. A Dream Pattern. Have you seen the “World’s Easiest Sweater” pattern? 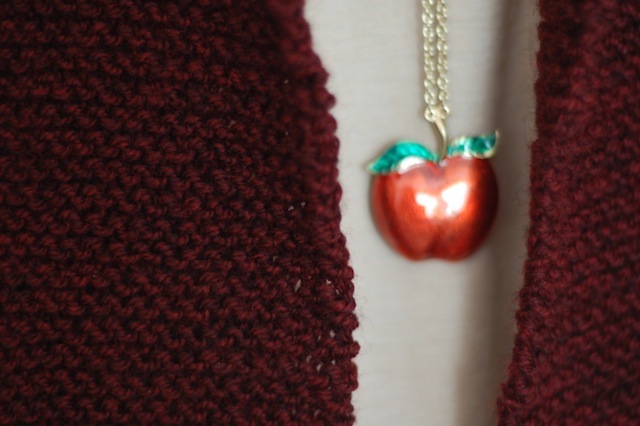 Like this, it can be done in either crochet or knit, any stitch, any yarn, any size instrument! Only problem with that sweater is that the sleeves, being rectangles, are kind of huge at the wrist! I like to end them at about 3/4 length, then do a perpendicular cuff. I have made 5 of these in different sizes – one in mitred squares. The back in squares, then pick up the stitches round the sides as per the instructions, knit 20 rows. Cast of and then pick up stitches and knit rows of mitred squares untill the front is big enough. It is exquisite! I must look for the pics or ask my sister to send ma some. It came out beautifully! She was ecstatic about her gift! omg…a woman after my own heart….this will be a piece of cake for xmas this year….I used to knit cable outfits when my kids were little, socks, scarfs, hats….was running out of ideas. Thank you sooooo much for sharing…can’t wait to get the yarn and start. could you tell me what stitch you use to close the seams? I cannot bring up the pattern…….Were you able to????????? I love your approach to knitting! 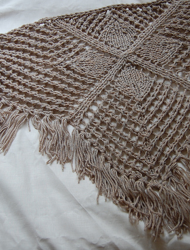 I had been wondering how to make a triangular shawl and started with your very basic directions, throwing in a bit of purl row texture every now and then. I am very amused at people guessing at what pattern it is (“Brass and Steam?”) and the incredible compliments I get. Really, I just get a bit bored and distracted and change it up a bit. This is top of my queue for post-holiday knitting!! Thank you!! I’d like to try this vest. 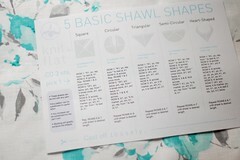 Can you break down the pattern to even sizes and stich gauges instead of ‘just measuring’? It is easier to follow a pattern like that, for me anyway, an intermediate knitter. Please advise how stitches you have cast on for both pieces. I am unable to visualize HOW the vest pieces are sewn together. 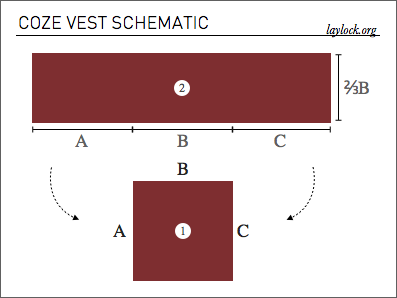 I want to make this for a small child and need to know the dimensions of each piece – do A,B & C = the same length? 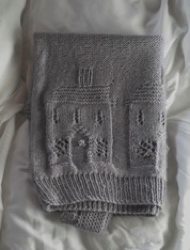 Thanks so much – I love the look of this and have had it in my knitting bag for a year, but still have not made it. Have I got news for you….. I used your basic instructions and crocheted it. It is beautiful. Thanks again! Absolutely rolling on the floor laughing at the instructions for “like me and just can’t be bothered”!!!!! Glad to know I am not alone in my undisciplined approach to knitting. Hi – I agree with Laura, and there does not yet seem to be a response. I tried to work it out with little pieces of paper, and still can not figure out how to put the two pieces together to make a vest. The photo, being such a dark color, doesn’t give a clue, and I feel pretty dumb about this, but the vest looks very nice, and I’d like to make it. Please help with a clearer diagram and explanation!